They say apart from Samurai Night, you are not a true KYUEM-ian if you have not experienced Bangsawan Night. And after last night's Bangsawan I can assure you there is great truth behind those words. We only had 3 weeks to prepare for our stage performance for the big night and well, let's just say it wasn't easy...AT ALL. Practices ran everyday from 4.30pm to 6.30pm and later at night up to 10.30pm. For the past 3 weeks, I don't think any of us could manage to sleep before 2am while we tried to keep up with our classwork and readings despite the exhaustion after long hours of practices. Teachers were getting slightly weary of our sleepy heads in classes too. But I think we had an amazing time going through the Bangsawan journey. We got to bond with the other House members and it's the perfect timing to get to know the newly-arrived Batch 14 juniors better. We got to see our friends unleashed talents and creativity we never thought they had. And we learned the essential elements that make up who we really are, as part of the House and the college; teamwork, patience, perseverance, good sense of humour, competitive spirit, the drive to have fun and enjoy the things we do. 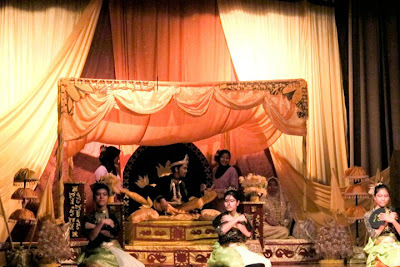 Topaz's drama was called 'Titisan Darah Sukma' directed by Yasmin with Keri as the Sultan, Qistina as the Queen, myself as the evil, bitchy second Queen and a few others, Megat, Nadeem and Adib. We had our own interpretation of the characters and I think we did a fairly impressive job in trying to portray each character. What made it even more special was the presence of our superseniors who were willing to come all the way back to KY to watch our rehearsals and give feedbacks where necessary and heightened our spirit just in time for the night. We had past Bangsawan directors from Batch 10, Batch 11 and Batch 12 coming in and giving tips on how to improve our performance. On how to do 'stage blocking', the best make-up for the character, voice projection etc. Knowing that we had the support from these seniors, it was enough of an assurance that we'll be alright that night. Others might question our winnings but the thing I've learned about Topaz after being with them for a year is that we do not seek for victory every time we get involved in college events or competitions. Rather, we seek the enjoyment and satisfaction that we will get out of the process of reaching the end. We were always reminded by our seniors that our niat or intentions have to be sincere in everything we do. Not to seek glory and flaunt it to others but to do the opposite; to celebrate what we have achieved with our hardwork and to remain humble with each achievement. And as the present seniors, it is now our duty to remind our juniors of the same thing. I find that Topaz has practiced 'tried and tested' formula in the way we handle a lot of the things because we take after past leaderships of the House. But at the same time, each Batch will add their own flavour and improve from there onwards. Looking back at last night, I honestly did think each House put up an amazing performance. Didn't get to see Garnet's but my parents who were present in the audience thought Garnet's drama was entertaining to watch. I loved Diamond's beautiful, majestic-looking props as well as the feisty characters and plot they portrayed. I saluted Sapphire for personifying the strength of women in their drama and the characters' scrupulous abilities. Photos should be coming up sooner or later. All I have now is this photo of Topaz's Singgahsana scene taken from Almaz's Facebook.